Christmas snacks CAN be healthy! 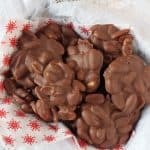 These Chocolate Caramel Nut Clusters are high in protein and low in sugar, the perfect paleo snack for the festive period! If I had to name two ingredients that I seem to buy in abundance this time of year then it has to be chocolate and nuts. 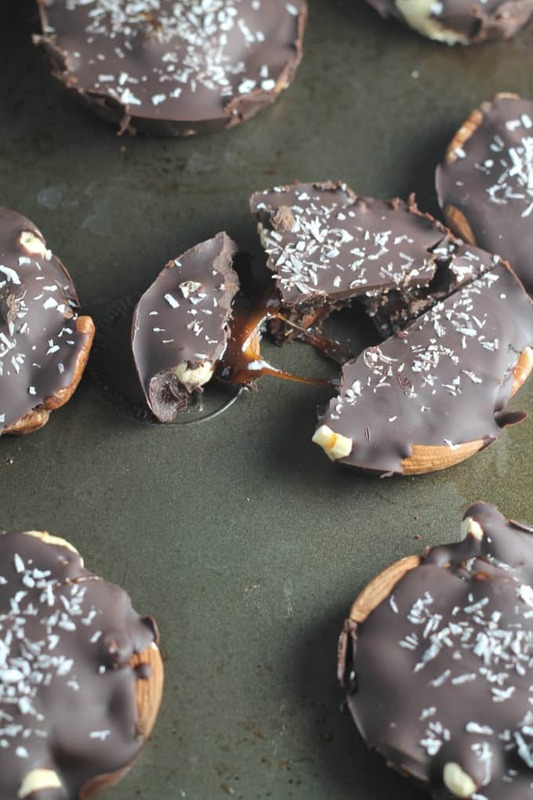 Christmas just isn’t Christmas without having these nibbles to hand so I thought why not make them even better by combining them with some caramel. Mmmmm…. festive treats at their best! I know I seem to be posting a lot of sweet treat recipes at the moment but hey, it’s Christmas and technically these Nut Clusters are healthy…. antioxidant rich dark chocolate, protein packed nuts and refined sugar-free caramel… it’s all good for us right?!! I use cupcake tins to make these as it means I get a nice round shape to the clusters but it’s fine to use a normal baking tray instead. 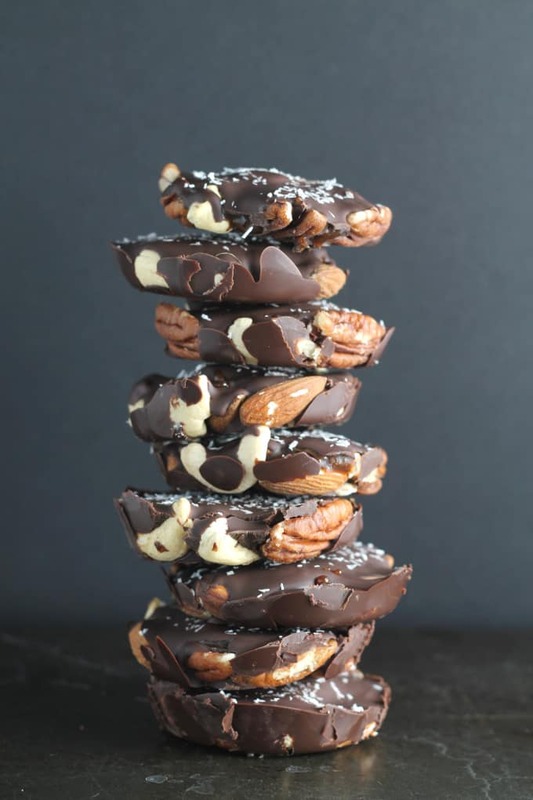 The first layer of chocolate sets the bottom of the clusters and binds the nuts together. 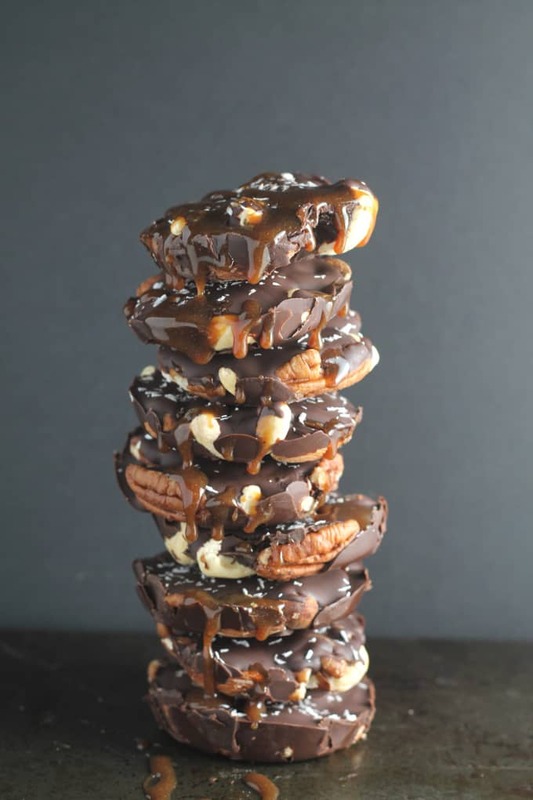 Once this has cooled and set the caramel layer sits easily on top and the final layer of chocolate encases the top of the clusters. It sounds complicated but honestly they are so simple to make. 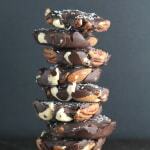 I used cashews, pecans and almonds but you can use any of your favourite nuts. To keep these treats as healthy as possible and low in sugar I used 70% cocoa chocolate but any type will work well. These clusters would make a lovely edible gift. Simply wrap them up in cellophane and decorate with a festive ribbon. Your friends will be begging you for the recipe! Break the chocolate into small chunks and melt it either in the microwave or in a heat proof bowl over a pan of boiling water on the hob. Divide the mixed nuts between the twelve holes in a cupcake tray. Pour 1/2 tablespoon of the melted chocolate on top of each pile of nuts and place the tray in the fridge to allow the chocolate to harden. Meanwhile make the caramel by heating the coconut sugar and water together in a pan over a medium heat. Bring to the boil before adding the coconut milk and reducing to a high simmer. Cook for 10 -15 minutes until the caramel thickens, stirring regularly. When the caramel is ready remove the cupcake tray from the fridge and spoon approximately 1/2 teaspoon of caramel on top of each of the clusters. Add a final 1/2 tablespoon of melted chocolate on top and garnish with desiccated coconut or sea salt. Refridgerate again for 10 minutes. Once the clusters have cooled and set use a knife to loosen the edges and remove them from the cupcake tray. Store in an airtight container at room temperature or in the fridge for up to a week. Desperately need the snow to stop so I can get to the shops and get the ingredients to try these! Everything I love in a snack! These clusters sound fab. New to coconut milk etc. When I searched online it seems you get one in a carton like other milk products or the type I know that you put in curries. Which type I’d used in your recipe? Hi Nicole, I always use canned coconut milk. The type in cartons (like other milk products) often has lots of unnecessary additives, making it less healthy and also I can’t guarantee that the recipe would work the same. Would cashew milk work in place of coconut milk? These clusters looks amazing, I’ll have to make them as soon as possible! Great recipe! Thank you. We really love them in our house! Thank you. They are so tasty. Hope you love them! These look delicious and would make perfect edible gifts! Thank you Nic. 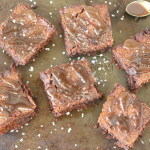 I love recipe swaps for discovering new blogs! Oh my. These look incredible and your photo’s are absolutely gorgeous! You should be able to find coconut sugar in a good health food store. Or I buy it in bulk on Amazon. And yes, as they are totally healthy you can have as many as you like!!! Gorgeous! These look so tasty! Ah, these look amazing! What a great idea! 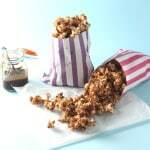 Love the sound of the caramel although getting coconut sugar isn’t too easy..
You are so right. This would be amazing after dinner with coffee. Merci! Chocolate, toffee & nuts, a delicious combo. My mouth is watering at the sight of these little beauties. I’ve never made caramel with coconut sugar & milk before, going to give it a try. You definitely have to try the caramel Sarah. It’s so good! Thank you. Hope you like them as much as we do! They would make fab Christmas gifts Mirta!